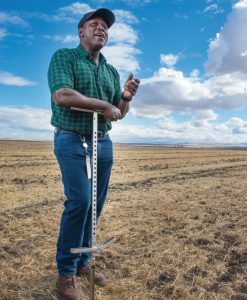 Oregon State University researcher Dr. Stephen Machado wanted to address some of the soil health challenges of the dryland wheat cropping system—soil acidification and low levels of soil organic matter. He decided to look at biochar as a potential solution. After conducting field trials at the experiment station near Pendleton and at farmer’s field near Athena, Oregon, Dr. Machado found that biochar application at a rate of 10 tons per acre raised soil pH and increased crop yield by almost 30%. Farmers in Eastern Oregon have been growing wheat without irrigation since the 1880s. Low annual rainfall means that in order to conserve soil moisture, many farmers only grow a crop every other year. This production system is known as a wheat-fallow system. Here’s how it works: the first year, farmers plant and harvest a wheat crop. The second year, farmers keep the field fallow to allow moisture to accumulate in the soil. The third year, when the field is planted with wheat again, there is 30% more moisture available to the crop than there would be from annual precipitation alone (Schillinger and Young, 2004). This means that farmers can reliably grow high yielding wheat without irrigation in a relatively low rainfall area. Unfortunately, sometimes solving one problem leads to another, and growing a crop every other year also means that there is only half as much crop residue going back into the soil. Additionally, the residue that is left in the field decomposes very rapidly because of soil management practices like tilling, which is practiced in part to reduce evaporation and conserve water. Although many farmers have reduced or stopped tilling their fields, wheat-fallow rotation systems still do not produce enough residue to maintain levels soil organic matter and soil carbon (Ghimire et al., 2017). Regional farmers are in a bind because if they start to grow a crop annually to replenish soil organic matter, they will not have enough soil water to maintain crop yields. Additionally, repeated ammonia based fertilizer applications have lowered soil pH in the region, and yields are being negatively affected as a result (Ghimire et al., 2017). Dr. Machado wanted to use biochar as a soil amendment in the region because it has similar properties to soil organic matter and would replenish soil carbon levels. According to NRCS, a 1% increase in soil organic matter will increase soil water retention so much that it is equivalent to applying 25,000 gallons of water per acre. Biochar is also high in cation exchange capacity, which helps to retain nutrients in the root zone. 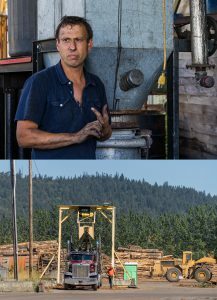 Dr. Machado chose to use a conifer wood biochar produced by John Mediema of BioLogical Carbon in Philomath, Oregon. In addition to the soil nutrient and soil water properties of biochars, Dr. Machado chose this product because it is a high pH biochar (pH 10), which he hoped it would help to raise soil pH without the need for lime application. Dr. Machado set up field trials at the Oregon State University’s Columbia Basin Research Center near Pendleton and Athena, OR. He decided to set up long-term plots to evaluate if the effect of biochar application could be sustained over several years, or if biochar needed to be applied annually in order to see an impact. Plots were amended with 0, 5, 10, 20, and 40 tons of biochar per acre and then planted using standard management practices. The experiments are now in year four. He decided to evaluate wheat and pea, two widely produced regional crops, and he found that there was a clear increase in crop yield for both crops due to biochar application. Additionally, he observed that pea plants looked bigger, more colorful, and generally healthier in the high biochar plots. There were no visual differences with wheat plants, but there were differences in yield. 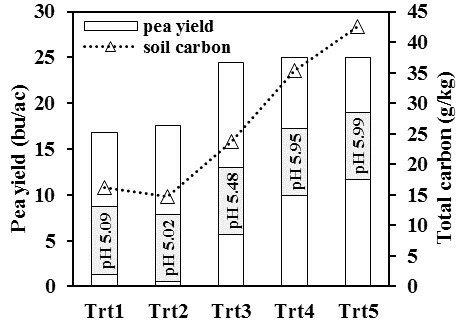 The effect of biochar tapered off above 10 tons per acre, after which no additional yield benefits were observed. This means that the maximum recommendation for regional growers is 10 tons of biochar per acre. Dr. Machado has also measured positive effects on soil pH with biochar application. In order to produce a healthy crop, soil pH must be maintained above 5.5 (Hart et al., 2013). Initial soil pH in the top foot of soil was too low, between 4.6 and 5. After biochar applications, soil pH has shifted up by 0.2 to 0.4 units. This gets farmers much closer to a healthy pH. Dr. Machado is currently conducting soil analyses to evaluate the effect of biochar on other soil properties, namely soil carbon, cation exchange capacity, nutrient levels, and water holding potential. Once these results are available he will have a more complete picture of the impacts of biochar on dryland production systems. 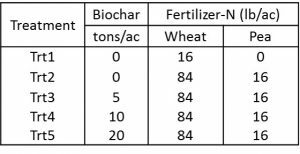 Biochar and nitrogen quantities used in field treatments. Biochar increased wheat and pea yields up to amendment rates of 10 tons/acre. 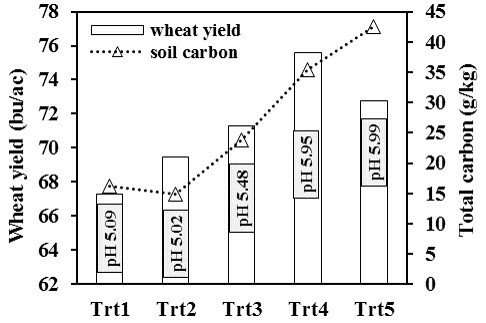 Yield increases were associated with increasing soil pH. Now that Dr. Machado has established that biochar has a positive impact on crop production in his region, he wants to take the work a step further. Since biochar is mostly carbon, it has a very high carbon to nitrogen (C:N) ratio, about 500:1. This means that farmers have to apply nitrogen fertilizer before planting to maintain a soil C:N ratio that allows for optimum microbial activity and nutrient availability. There are large-scale dairies in Eastern Oregon that are generating large quantities of manure sludge. This waste product is high in nitrogen and can lead to nitrogen leaching into groundwater if not properly managed. Dr. Machado wants to take advantage of this regional nitrogen pool by “charging” the biochar with the dairy sludge before applying it to the field. The idea is that that nitrogen will stick to the biochar, lowering the C:N ratio. This means that farmers will have to apply less nitrogen fertilizer at planting, and that less nitrogen is available to leach from dairy ponds. If he is successful, he will be solving multiple issues at once: soil fertility and ground water protection! Dr. Machado definitely plans to continue using biochar. He thinks it is a great solution for improving soil health in the region because it allows farmers to solve multiple problems at once. 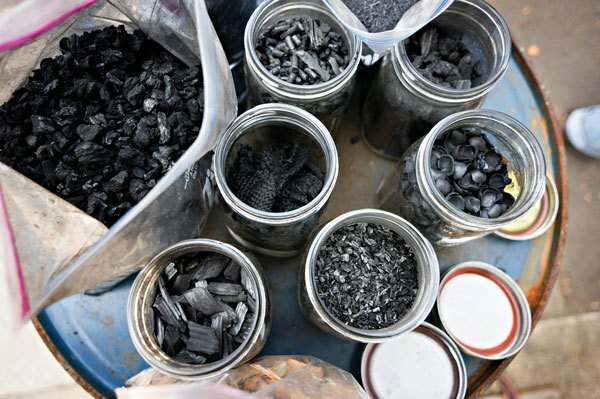 Additionally, there may be opportunities to produce wood biochar locally. Regional forests generate forest trimmings, which they pile up and burn. If there was a way to use those forest byproducts to produce biochar, they could be used on regional farms. Although there are several steps required to set it up, it may be possible to set up this type of forest to farm system down the line. Biochars and soils vary widely. Dr. Machado stresses that it is important to know both the chemistry of your soil and of your biochar before applying it to your soil, especially if you have a clear objective in mind. If you want to raise soil pH with biochar, you have to apply a high pH biochar. If you want your biochar to act as a proxy for organic matter, you have to apply a biochar with greater surface area and thus more cation exchange sites. Applying the wrong biochar will lead to disappointing results. If he could start over, the only thing Dr. Machado would change would be the size of the field plots. Although he is able to measure differences with his current set up, one acre plots would better simulate a field on a farm. Additionally, they would be easier to manage using field equipment like a combine. Ghimire, R., Machado, S. and Bista, P.: Soil pH, Soil Organic Matter, and Crop Yields in Winter Wheat–Summer Fallow Systems, Agron. J., 109(2), 706, doi:10.2134/agronj2016.08.0462, 2017. Hart, J. M., Sullivan, D. M., Anderson, N. P., Hulting, A. G., Horneck, D. A. and Christensen, N. W.: Soil Acidity in Oregon: Understanding and Using Concepts for Crop Production, Oregon State University Extension Service., 2013. Schillinger, W. F. and Young, D. L.: Cropping Systems Research in the World’s Driest Rainfed Wheat Region, Agron. J., 96(4), 1182, doi:10.2134/agronj2004.1182, 2004.